This condition, also called AC joint arthrosis, is a degeneration of the joint at the top of the shoulder where the acromion meets the clavicle. 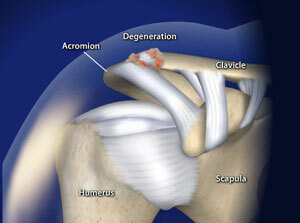 This results in pain directly to the AC joint at the top of the shoulder. The pain is often worse when moving the arm inward across the body. People who engage in repetitive heavy overhead work are at greater risk for this condition. Click on shoulder conditions to learn more! Need Information About Other Orthopedic Conditions? We invite you to visit Keiser Orthopedics today to learn how we can help! © Copyright 2018 Dr. Darren Keiser MD - Omaha, Ne - All Rights Reserved.